#NailsOfTheDay: Book Your Manicure Sesh, These Kylie Jenner Inspired Nails Are Everything! Monsoon got you feeling 50 shades of blue? We've got just the pop of colour to brighten up your rainy days. 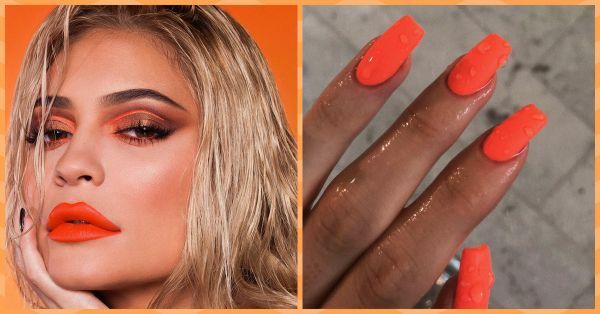 Kylie Jenner posted a photo of her nails and we're obsessing over that shade of orange. It seems like it was inspired by her latest summer collection that's due to be launched on the 13th of August. If you follow Kylie's social media, you'd agree that her nails deserve their own Instagram account! Every nail photo she IG's; turns into a raging millennial gel manicure trend. The latest photo shows off her matte neon orange talons and..... I WANT! Looking for more neon nail inspiration? Keep scrolling! Are you going to take these bright orange nails for a spin? !